The Lumintop IYP365 Ti is a light I've long thought of as the most appealing pen light on the market, so I finally bit the bullet and ordered one from BangGood. I'm not going to link it there, because they sent over the light with a 219C emitter even though they advertise it with a 219B, and I'm still grumpy about being lied to. This is a pen light made of titanium, with a high CRI led, 3 brightness modes, and it runs of off 2 AAA cells (like most pen lights). Lumintop also makes the light in brass and various colors of aluminum, and they also sell a low CRI version with an XP-G2. If you're buying a pen light, it won't be the most powerful thing ever, so I would personally recommend the Nichia version in all cases. Even though I'm not happy with the ordering process, that certainly isn't Lumintop's fault. The light itself is a pleasure to use. There are a few small details that remind you it is still not entirely a premium product, as the fancy material might have you believe - but overall, I'm very happy with it. If you're looking for a pen light, I would certainly recommend this one. The light measures 125.5 mm long, 14.5 mm at the widest point and 12.5 mm at the slimmest. The light weighs in at 33 grams without cells. 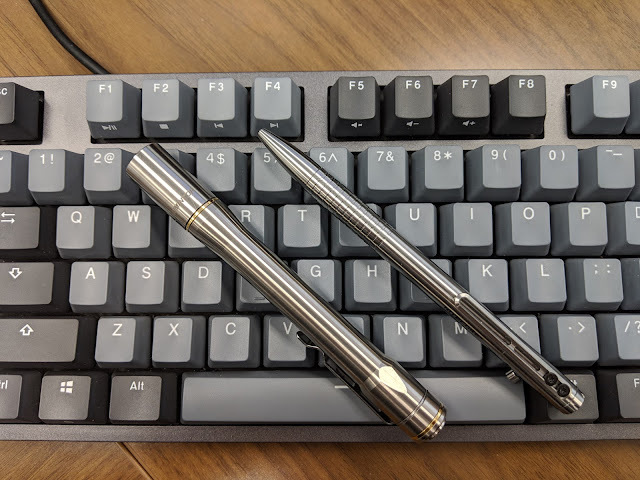 I actually don't own any other pen lights to compare this to, but here it is next to the Nitecore NTP30, which is a surprisingly average sized pen. The light is constructed almost completely of titanium. Machining throughout is good. It has a bit of a texture when you rub your nail across it, much as titanium tends to. I'm a fan of this feel, as it adds grip without requiring knurling. The head of the light has a smooth bezel with a slight chamfer. One side of the head is etched with the Lumintop name and logo, and the opposite side is etched with the product name. According to Lumintop, "IYP" stands for "In Your Pocket", meaning the light is small enough to live in your pocket 365 days a year. At the two ends of the light, there are small brass accent rings. The ring at the head of my light is not clamped down by the head. This means the ring can wiggle a bit and spin freely. Functionaly this isn't a problem, but it's a bit sloppy, and indicates loose tolerances. Unfortunately this is the one feature of this light that reminds me, even though it's a premium material, it's still a 'budget' light. If you don't like the look of the brass ring, this can be removed, but it will leave a notch between the body and head of the light. The cell tube tapers from the head to a narrower body. At the tail it widens again, and there are four cuts around the tail for aesthetics. These do not serve to stop the light from rolling on a flat surface, and they're at slightly different depths, again pointing to some loose tolerances in the machining. The difference here is not noticeable unless you're looking for it. The tail of the light has a metal switch cover, another brass ring, and a pocket clip. I was not able to unscrew the upper part of the tail to remove this second brass accent, but I imagine that is possible with enough encouragement. I'm not sure if the switch cover is steel or titanium, but either way it blends in quite well. Inside the head of the light, the positive contact is handled with a brass button. Although the trapezoidal threads are not insulated, slightly unscrewing this joint did work to lock out the light. The tail threads are similarly cut, but smaller. The body tube is not reversible, and loosening this joint does not lock out the light. Since the pocket clip is in the way here and could scuff the light, I would recommend changing cells from the other end. The negative cell contact is served by a spring. The aluminum versions seem to ship with a diffuser included, but the other metals do not. This is a pen light. By nature, the ergonomics of such a slender design are pretty good. The tail switch has a very short travel for half presses when changing modes, so it's easy to accidentally turn off the light until you're used to that. The clip is good, too. Clips with this profile - parallel to the body, with a circular pressure point at the far end - always work great for me. The have enough grip to stay put, but slide onto clothing easily. I've started to notice that all my favorite clips have this shape, and this one is no exception. The clip is screwed into place, so it shouldn't be at risk of coming loose. It can be removed, but will leave a gap in the body. The clip can spin around the body when installed, but doesn't spin freely when the cell tube is tightened. This light has a single reverse clicky switch at the tail. It always turns on in medium. A half press while on goes to low, and another gets to high. This isn't the mode order I prefer, but once you're used to it it's not an issue. It makes sense, too - the light defaults to turning on with a usable output of a claimed 25 lumens. The second press gets 1.5 lumens, and you can easily cover the head of the light when switching this on as sort of a mode shortcut. The high mode is claimed at 125 lumens. The 219C used in the orange peel reflector has a great neutral white beam. Being a pen light, this isn't super powerful. It's designed to give a bit of light at close range, and that's what it does. As already mentioned, the 219B is known to have a nicer beam, and that's what this was sold as, but that's mostly just me being picky - 219C is great in anything other than a head to head comparison. The runtime was tested with two Ikea Ladda NiMH cells. On high, the light lasted 1 hour and 15 minutes, which is more than double the manufacturer's claim, and the output was stable for most of the run. On low, the output seems to track downwards with voltage, but stayed on for about 9.5 hours. This is much lower than the 25 hour claim, which is unfortunate.